A flier for the upcoming Jeffrey Harrison poetry reading at Breanu University’s historic Gainesville campus. 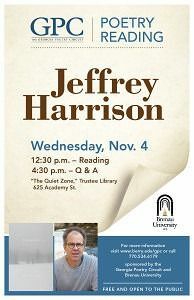 Award-winning poet Jeffrey Harrison will visit Brenau on Wednesday, Nov. 4. Winner of two Pushcart Prizes, he is the first of four nationally-acclaimed poets to make an appearance at the university over the next few months as a part of the 2015-16 Georgia Poetry Circuit. Harrison will present a free reading of his poetry at the Brenau University Trustee Library on the Gainesville historic campus from 12:30 to 1:30 p.m. He will meet with students at the same location for an expanded question and answer session from 4:30 to 5:30 p.m. The Georgia Poetry Circuit continues throughout the spring semester. Authors Margot Schilpp and Jeff Mock will visit Brenau on Feb. 10 and poet Andrea Hollander will stop by the historic Gainesville campus on April 11. For more information on the series, please visit http://www.berry.edu/gpc or contact Sandra Brim at ude.uanerb@mirbs.